Ester C – Vitamin C assists in the production of collagen, one of the key components of bone. This patented form of calcium ascorbate offers greater absorption and retention than all other forms of vitamin C. It has a neutral pH (non-acidic) and will have a longer lifespan in your child’s system. Vitamin D3 – Also known as the sunshine vitamin, this nutrient is essential for the proper uptake of calcium. Vitamin D3 assists in the passage of calcium from the intestinal tract into the bloodstream. Magnesium – This mineral assists in the absorption of calcium, regulates the transfer of minerals through the cell membrane, aids in the formation of bone and increases the biochemical activity of vitamin D.
Mineral Citrates – Only a small percentage of the minerals that we normally consume are actually absorbed and utilized by our bodies. However, minerals in citrate form have a much higher absorption rate and are transported into our cells far more efficiently. Green Food and Vegetable Concentrates – This comprehensive combination of highly alkaline, nutrient-rich green foods includes broccoli, alfalfa, kelp, spinach, and wakame. They improve blood pH and detoxify impurities normally found in a child’s diet. These vegetables themselves are a source of highly absorbable botanical calcium. Digestive Support – These include the plant-based digestive enzymes bromelain and papain, as well as Bioperine®, the patented piperine extract that improves the passage of nutrients across the intestinal wall and into the blood stream, thus increasing the absorption of the entire formula. EFA Complex – The essential fatty acids found in flax seed and sunflower oil (CLA) play a very important role in both bone formation and maintenance. As well, EFAs are beneficial for improving focus, concentration and sharpening mental acuity. Specifically Designed for Children – Although calcium is the cornerstone of this supplement, a uniquely tailored array of complementary nutrients, including essential fatty acids, digestive enzymes and green food and vegetable concentrates allow this formulation to address a number of additional nutritional challenges that our children face daily. Divided Doses – Our bodies are not designed to be nourished in one large dose once a day. Without question, smaller, more frequent meals allows for better utilization of the nutritional value of our food. The same applies to the nutritional supplements that we consume. 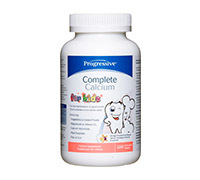 Complete Calcium for Kids is designed to be taken twice daily in order to offer optimum calcium protection. Professionally Formulated – The Progressive Complete Calcium for Kids was formulated with the assistance of a renowned naturopathic doctor. Each component has been chosen for its efficacy and harmony within the entire formulation. This in turn offers great nutrition for kids, and peace of mind for parents. Naturally Flavoured and Sweetened – Many popular children’s chewable supplements contain large amounts of sugar and are unfortunately both artificially flavored and coloured. In contrast, our children’s chewable calcium contains a combination of natural citrus and berry flavors and is sweetened with a blend of pure ingredients that includes honey powder and organic maple syrup. Airtight Packaging – All of the Progressive Nutritional Therapies products are packaged using a two-step sealing process. The clear outer seal offers tamperproof protection while an additional inner induction seal provides a secure, airtight barrier guaranteeing product potency and freshness.